One of my favorite Iron Chef episodes of all time comes from the 1994 season and features Katsuyo Kobayashi (the Julia Child of Japan) in battle against Iron Chef Chen Kenichi. In the episode she prances around the kitchen, sings, taunts Chen and eventually wins the battle making a nearly unprecedented seven dishes in the allotted hour. If you haven't already seen it then I highly recommend watching the first Iron Chef Potato Battle. One of the dishes she made was Nikujaga which is a Japanese beef and potato stew. For some reason this really struck my fancy and I spent the last few days wishing to make it. Unlike most of the dishes made on Iron Chef this one doesn't contain shark fin so it wasn't immediately outside the realm of possibility to make this. In the episodes Kobayashi accidentally dumps a tremendous amount of sesame oil into the dish thinking it was something else. When she realizes what she's done she just shrugs and says it'll just make the dish taste better anyway. I tried to keep my recipe a little lighter than that but followed what I saw her do on the show as best I could. My obaachan also used to make this dish (of course) but since she has passed on I had only what I observed Kobayashi do to guide me. I was so excited to make this that I even broke out our wok which I haven't used in years. This past month has been so much like the 90's I could swear I have somehow been temporally transported back to to 1997. All I'd need to make this complete would be to work 125 hours a week and the feeling would be complete. Tomorrow night I think I'll put on some Ben Folds Five to set the mood. 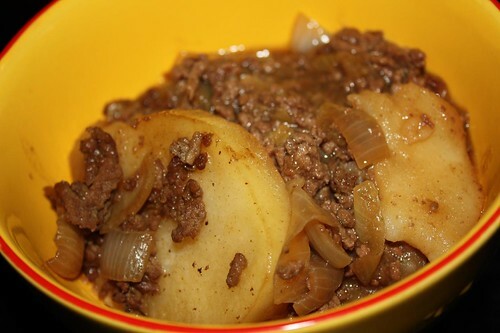 I heated up a little safflower oil and sesame oil in the wok, tossed in about a pound of ground beef, browned it, tossed in two peeled and sliced russet potatoes, and two small chopped onions and tossed it all around. After a few minutes I added some soy sauce, brown sugar, a little water, and some mirin and let it stew on the stove for about twenty-five minutes. Kobayashi (or at least what I observed her do) did not steer me wrong. It was a pretty tasty stew. A little research shows that this is an extremely popular dish in Japan. What's new to me is undoubtedly boring to anyone who grew up in that country. However, I may be able to excite a native of Japan with my American equivalent: macaroni and cheese! Just to be a complete hambone I decided to pick up a can of Sapporo to accompany the stew. 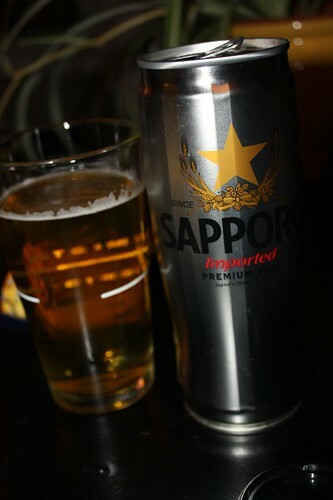 I'm pretty sure I haven't had a Sapporo since the 90's either. I guess moving to Westchester, amidst the sea of Asian-fusion restaurants has really rubbed off on me. I can't wait to get a job cooking in a restaurant making $6.50 an hour. Then the circle will be complete!